Meeting and bringing home your new dog is an experience that you will likely remember forever. This is a hugely important time in which you begin a connection that will last for many years to come. This time is also important because it will begin to establish the routine and rules of your household. Take a breath and read on to plan the first seven days with your rescue dog. 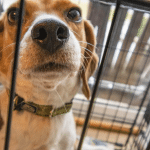 If you haven’t decided whether a rescue dog is right for you, learn what you need to know before adopting a rescue dog. If you’ve made the decision to adopt but aren’t sure how to get started, learn where and how to rescue your new dog. If you have other pets, this first week will be the time your dog becomes integrated into their social circle. 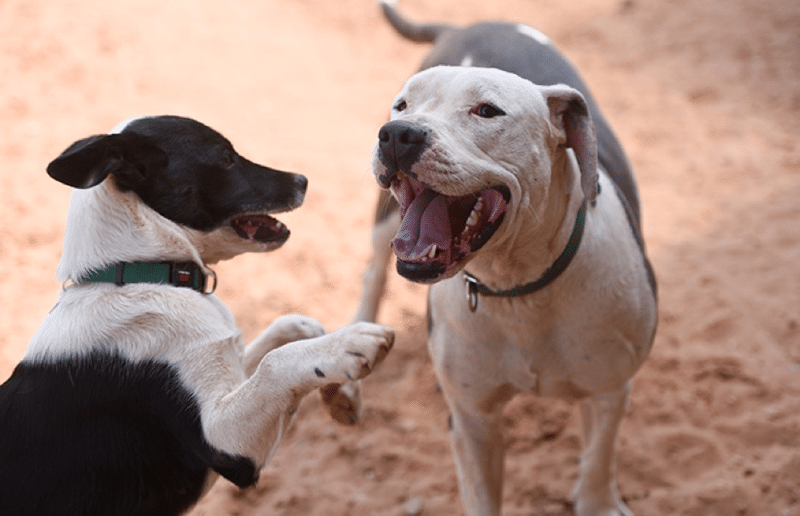 Even if your new dog has met your current dogs before, living together is an entirely different experience. While you are sure to be very excited about your new dog, it is extremely important that you remain calm and work carefully to make sure that this is a good experience that sets the foundation for your dog’s life with you. It is important that you have your new dog’s space set up before she comes into your home. It is best to set your dog up in the room that she will sleep in, but if the final sleeping area does not match the following requirements, you can choose a temporary area for the first week or two. It is best that this room not be in the central living area of the house, but you also don’t want to use a space that is very far from the family. The ideal area would be a space near the living area that can be closed off with a baby gate. This space will be where your dog can feel safe and also observe and engage with your family as you get to know each other. Your new dog can interact with existing pets and children safely through the barrier while you gauge her behavior. When you can’t watch your new dog, she can go into her crate. Make sure that the crate is a comfortable and safe place for your dog. If you don’t know about your new dog’s previous habits choose a flat crate pad that will discourage chewing. The crate should be large enough for your dog to stand up fully and easily turn in a circle, but not much larger than that or your dog may be encouraged to eliminate in the crate. A dog should never be made to spend very much time in a crate. 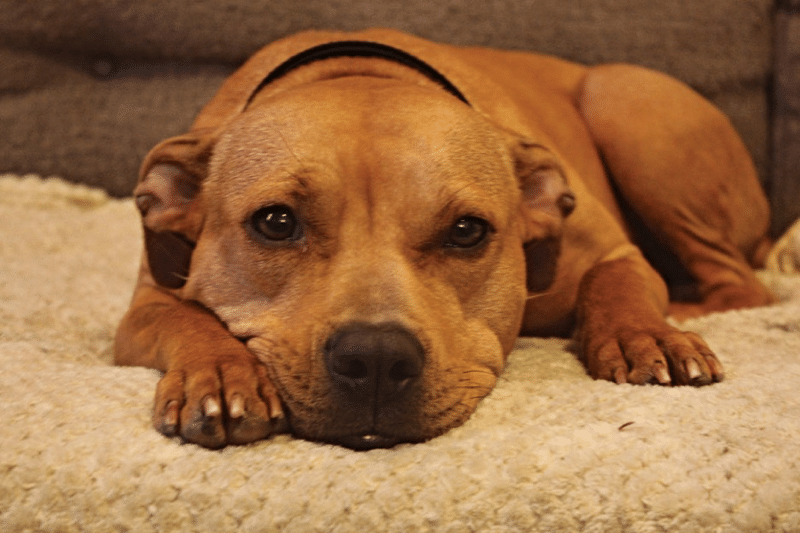 You might want to read this great advice on crate training your dog. Stock lots of toys and reward treats near your dog’s area so you can quickly grab a treat to reward your dog if she is behaving well or chew toy to distract her from undesirable behavior, but far enough away that your dog will not be able to reach it. Buy as many chew toys and food dispensing toys as your budget will allow. Dogs love to chew and engage their mind with the pursuit of food, and rescue dogs in particular have a lot of stress and anxiety which can be relieved by these activities. Think of chew toys and food dispensing toys as pacifiers for your dog, soothing anxiety and occupying a worried mind. Be careful to choose toys that are appropriate for your dog’s size and chew level and always observe your dog using the toy, especially for the first few weeks of using it. Toys should have ratings for the size and chew level of the dog on the label. Food dispensing toys like the Kong Classic have proven themselves on the market for a long time as being nearly indestructible four dogs from tiny chihuahuas to dogs with the most powerful jaws, provided you choose the right size for your dog. If in doubt, go a size up, as the design of this toy allows for versatile chewing even if it is a bit too big for your dog. 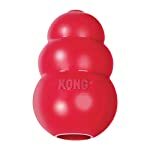 A version called the Kong wobbler allows you to put a serving of kibble into the toy conveniently for food rewarded mental stimulation. Provide plentiful water in your dog’s crate and insure it is always kept fresh. Use a secure water bowl that is screwed to the wire of the crate, like this one. You don’t want your dog to spill water while she is in her crate and end up thirsty with a wet bed. You can also adjust a clip-on bowl to the exact height that is comfortable for your dog to stand at to eat or drink, preventing digestive problems or discomfort. The first day bringing home your rescue dog is very exciting but can also be nerve-racking. Don’t worry, you already have a space set up for your dog and all of the equipment that you need to make her comfortable in your home. Less is more on the first day, as you want to create a calm and relaxing environment in which your dog can adjust. Simply being in this new environment will be enough stimulus on the first day. The Animal Rescue League of Boston encourages new rescue dog owners to limit activity, meeting new people, and long walks on the first day. Keep other pets out of the area and ask family members to stand back as you bring your new dog into your home and to the designated area. 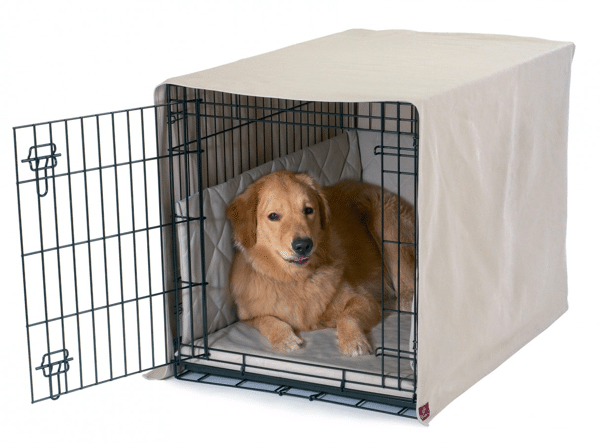 Show your dog her new crate and where her water bowl is and stand back as she settles in. Don’t give her attention unless she seeks it out. When she seems calm, exit the area, but stay nearby and go to the baby gate to pet your dog if she asks for your attention. When your dog is calm and relaxed, you can slowly let family members and pets into the area, one by one. Let your new dog greet your family and pets through the gate naturally, but do not allow anyone to pursue her if she pulls away. You can give your dog a durable chew toy to entertain her during this time. Every few hours, keep other pets away from your dog as you take her out on a leash to go to the bathroom. Reward your dog for going to the bathroom outside. Don’t spend too much time walking on the first day, just keep it to a brief walk. Even if you have a fenced yard, keep your dog on a leash at this time. If you need to leave your dog for a short period and at bedtime, put your dog in her crate, rewarding her for going in willingly with a nice treat or edible bone. It is wise to check on your dog during the night and take her out to go potty if she is awake or restless. If your eventual goal is to have your dog sleep in the room or bed with you, you can put the crate in the room with you now, but if you do not intend for your dog to sleep with you it is not a good idea to get her into this habit. If your dog has any potty or chewing accidents during this time, do not reprimand but simply bring your dog outside if she has eliminated inappropriately or replaced the inappropriate chewing item with an appropriate one. Watch your dog as closely as possible so you can catch her in the moment to gently correct. The second day is a good time to get to know your dog better. Spend time with her in her restricted area. Never force your dog but allow her to come to you at all times. It is a good idea to imagine a little square within the restricted area for yourself to stay in as you train. Work on teaching fun basic tricks likes “sit” and “up” and play games like treat hide and seek to build up trust and a bond between you. It is a good idea to be free with the treats during this time so that your dog learns that good things come from you and your family and to encourage her to seek out your interactions. Use a healthy small treat that is still high reward like to give your dog a big reward in a healthy low-calorie treat. Spend more time outside, watching how your dog reacts to her environment. Walk and run with your dog to provide exercise and keep her calm, but try to keep your walk restricted to places where you are unlikely to run into many other pedestrians, dogs, or wildlife, as you are still getting to know your dog. Many rescued dogs are lacking in leash manners. To walk comfortably with your new dog consider a chest lead harness that offers exact measurements with half sizes like the PetSafe Easy Walk Harness. Victoria Stilwell offers tips on comfortable leash training that can begin as soon as you begin to walk your dog. On the third day you can begin letting your dog into your living area for short periods. Keep other pets separate from your dog at this time and make sure children or other family members don’t interact with her without her approaching them. Allow your dog to explore a restricted area while you keep her on leash at first. Do not allow your dog to range freely through your home but observe her reactions very carefully and watch for any desire to mark or chew as she explores. Let her meet other pets on leash and gauge their reaction. In between exploring periods offer your dog chew toys and food dispensing treats to entertain her and continue to build on training using fun short sessions and positive reinforcement. Take your dog for long enough walks or runs that she is worn out at least once a day, with multiple longer walks being ideal. Keep a careful eye on your dog’s physical condition. Your dog may develop allergies to new things in your home or wear sores into foot pads that are not accustomed to walks. If your dog begins to develop sore paws due to previous lack of exercise on pavement, a paw salve like Musher’s Secret can heal soreness and protect paws from future injury. By the fourth day your dog should be getting some of the fun basic training that you’ve been working on together and adjusting to the routine of time on the leash, in the restricted area, and in the crate. 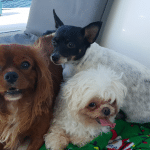 You will likely have seen and made adjustments for any kind of behavioral considerations in your dog around your other pets and family members and on your short walks. On the fourth day you can begin to treat your dog more like you will in your regular life together. Allow her more time out of her restricted area in your open living space, but still do not allow her in bedrooms or hallways and always watch her closely. If she has gotten along with other pets well through the fence so far, you can begin to allow them to interact together in the general space. 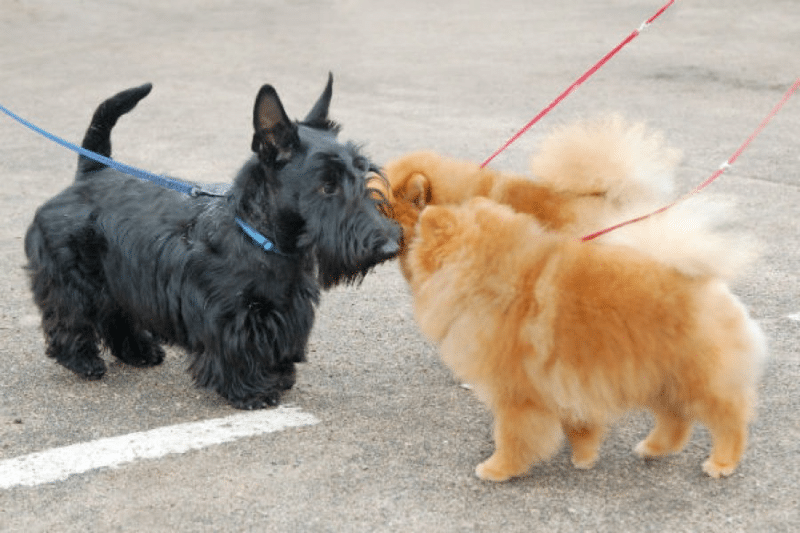 The AKC has great advice on how to introduce your new dog to dogs in your family and on the street. You can take a longer walk on this day and begins allowing closer passes by pedestrians and other dogs. Be careful to watch your dog’s reaction and not let her interact with strangers at this time. If all has gone well, on day five you can allow your dog to spend most of the time in the general area with your family. Be very careful to continuously observe your dog and make sure that no one pursues her into her safe restricted area, especially other pets. Watch to see if anything makes your new dog nervous or if she expresses dominance or guarding behaviors. Continue to maintain the routine of walks and crate time as before. 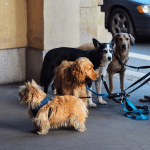 You can take a longer walk on day five and bring your dog closer to pedestrians and other dogs and into more crowded areas and places with distractions or potential fear stimulators so as to gauge her reaction to more stimulus and get to know her better. You can begin to allow your dog to explore more of your house, as long as you keep a close eye on her and only allow her into areas of your home that have been dog proofed. By now you may begin to see more interactions coming out between pets and between your new dog and other family members, so watch carefully to see how your dog’s personality is revealed as she becomes more comfortable in your home. You can take your dog on a more natural walk and let her sniff noses with other dogs or meet people, as long as she is expressing positive behavior and seems comfortable. At this point the restricted area will nearly always be open, with your dog going into her crate when you need to leave her alone and at night. By the end of your first week with your new dog she will be beginning to feel like part of the family. There is still a lot you have to learn about your new dog, and it is doubtless that mistakes will be made, but you will have had the opportunity to learn a lot about your new dog in this week so that you can make good decisions going forward. 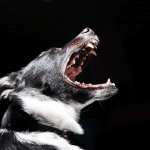 It is important that you don’t make assumptions about your dog’s behavior. Just because you haven’t seen her chew on your furniture in all the time you’ve been observing her does not mean that she won’t do it when you leave her out of her crate for the first time. It is very wise to keep your dog crated when you leave your home and at night, or whenever you can’t keep an eye on her. By the seventh day it is likely you’ll be able to remove the restricted area and put the crate in its final location, but if you have found it useful to be able to keep your dog in a restricted area due to problems with chewing or socializing with your other pets, you can certainly keep it for longer. If you have a setback, don’t feel disappointed in yourself or your dog. Remember that you are working with a rescue dog that has additional obstacles to overcome. Just go back a step and limit your dog’s freedom for a little longer while you continue to work on your bond. Be patient and watchful and soon you and your dog will trust each other and she will be a wonderful addition to your family.